The Incas Civilization: Customs. Coricancha, Cuzco, Machu Picchu, Inca Trail, Temple of the Sun. The Coricancha (from the Quechua word Quri Qancha meaning 'Golden Courtyard'), originally named Inti Qancha ('Temple of the Sun') was the most important temple in the Inca Empire, dedicated primarily to Inti, the Sun God. It was one of the most revered and respected temples of the city of Cuzco. Among the Incas, practically every man was married at least once. Polygamy was general among the upper classes and was regarded as a desirable state for those who could afford it. The Inca rulers, the nobles and distinguished military leaders, were awarded concubines. They were usually taken from one of the national boarding schools or convents, where attractive young girls or Chosen Women, selected annually from all over the empire, were trained. These Chosen Women, whose lives were consecrated to the service of the Sun, his representatives, the Incas and his priests, lived in sanctuaries which were scattered throughout the Inca Empire. It was deemed a great honor to a newly conquered province for the Inca to establish one within its borders. 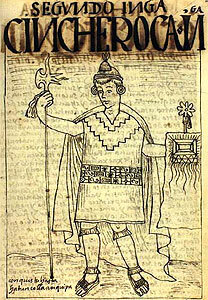 The second Inca, Sinchi Roca Inca. Illustrations from 1615 by The "Indian Chronicler" Felipe Guaman Poma. According to the Spanish conquerors, the most important convent was at Cuzco adjoining the Temple of the Sun. Other women were forbidden to enter that holy place. Men were not allowed in the royal boarding schools. The most beautiful and best born maidens in each province appear to have been selected early in life when eight or nine years old. They were supervised by older women who had lived for years in the convents. The girls learned not only to weave skillfully the clothing worn by the nobles as well as the beautiful robes and elaborate hangings used on state occasions, they were also taught the preparation of special foods and beverages used in great ceremonials. Apparently the girls were kept in the convents until they were about sixteen years old age, when they were divided into three classes based on their degree of beauty. Probably the most beautiful and highly born became concubines of the Inca Emperor himself. It is believed that some were selected to be sacrificed in honor of the sun, or at all events, to be interned for life in one of the convents where they could act also as temple attendants and as instructors of the Chosen Girls. A third group seems to have been given by the emperor as wives to nobles or military captains whom he wished particularly to favor. It was natural that the most desirable girls should be set aside for the worship of the sun, whom the Incas regarded as a benevolent and life-giving god. In the Andes, one is rarely comfortable except when the sun is shining. It is not surprising, therefore, that the worship of the sun involved such elements as propitiation supplication and thanksgiving. It was important that the priests should be served by the most attractive young women of the kingdom. Chosen Women or Virgins of the Sun. Our knowledge of the Chosen Women, or, Virgins of the Sun, is derived, in part, from the writings of Cieza de Leon, the greatest and most illustrious of the contemporary historians of the period of conquest. He say that at the doors of the convents porters were stationed to keep guard over the virgins many of whom were of noble birth, besides being beautiful and charming. He says that if one of them had any connection with a man she was killed by being buried alive and the same penalty was suffered by her paramour. 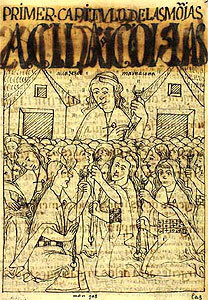 One of his contemporaries, Polo de Ondegardo, says that the convents were called aclla-huasi, meaning “the house of the Chosen Ones,” He says they were selected by the governors in the provinces who had the power to choose girls of the proper age without limit as to the number chosen. Their teachers were called mama-cunas. He says the number of women set apart for this purpose was very great and their parents could not excuse or redeem them under any circumstances. Estates were set apart for the support of the convents. He says, further, that great quantities of the cloth made in the convents were distributed among the Inca’s favorite soldiers and given to his relations and attendants. Also enormous quantities were deposited in storehouses to be used as needed. Illustrations: Guaman Poma - 'El primer Nueva corónica y buen gobierno'.